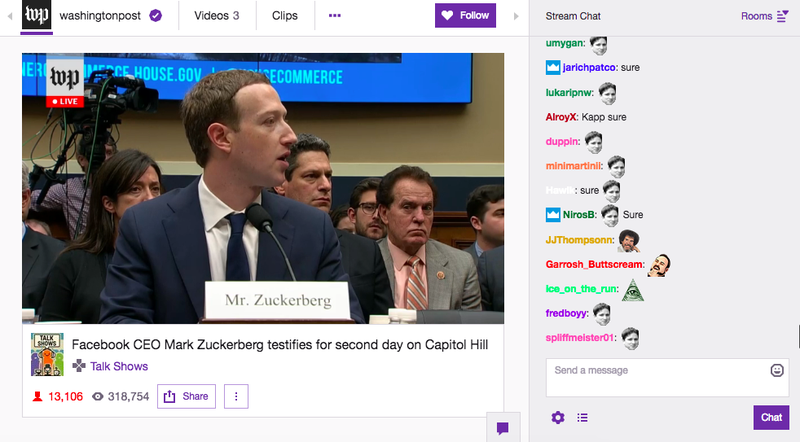 Over ten thousand people watched the second day of Facebook CEO Mark Zuckerberg testifying in front of Congress today on The Washington Post’s Twitch channel. The spammy, fast-moving Twitch chat for this hearing was like seeing the entirety of 2018 collapse into a self-referential black hole. Following the Cambridge Analytica scandal, where it was discovered that the political data firm hired by President Trump gained access to private information of 50 million Facebook users, Mark Zuckerberg testified in front of Congress to answer questions about privacy concerns. Twitch chat responded to this hearing in the only way it can—through memes and emotes. It’s a little weird to watch thousands of people process a complex political scandal by using the Kappa emote, but that is what happened. Twitch users made the hearing itself into a meme. Whenever Zuckerberg spoke, the chat started riffing on his rehearsed, robotic nature. When New York representative Yvette Clark had her chance to ask Zuckerberg some questions, Twitch chat spammed the Trihard emote, which is the emote of the streamer Trihex that some Twitch users like spam whenever a black person appears on a stream. They also spammed it when this Congressperson mentioned a black person. Stay classy, Twitch chat! In this one, from the end of yesterday’s hearing, a drained looking Zuckerberg stares off into the middle distance as a senator calls him “Suckerberg,” by accident.